I have been busy working on various projects for future reveals and I wanted to show everyone the beginning on one such project. Of course, I was so excited when I recieved the beads that I dived right in. So ignore the head pins and the crystal though I might give you a heads up on where I am going with one of my designs. 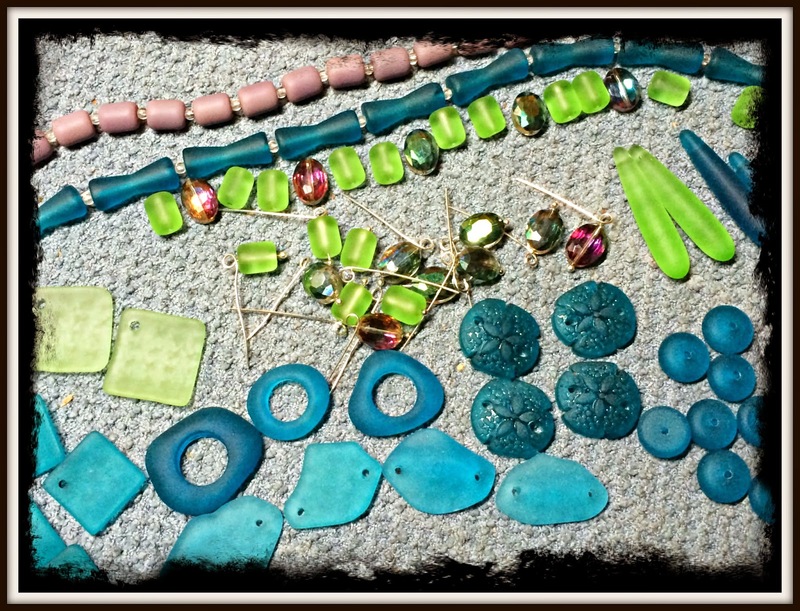 Just look at all that gorgeous Sea Glass that I was sent by ZNet Shows! I was lucky enough to be picked to work with them for their Summer Challenge. And I do mean lucky. They have some of the best glass pearls and sea glass around. Of course, it doesn't hurt that they are also have very nice gemstones. I have been asked to make up two designs or sets, one for evening and another for casual days. I already have a few pieces in mind. I will be showing off my designs as well providing links to all the other designs but I am not sure yet just what date this will all be happening on. I have to have the pictures of my designs back to the company on June 13th so the hop will be occurring some time after that. I love the glass that you got. I am sure you will have some great jewelry. Love the sand dollars. I've never seen those before. I'll have to order some. Can't wait to see what you do with them. and the blog hop is supposed to be around mid july.